Young Gifted and Black: He's Baaack! 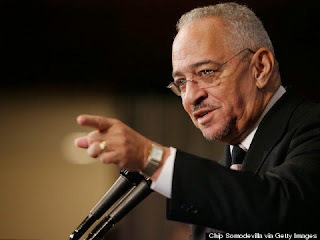 Reverend Jeremiah Wright Blasts President Obama on Drone Attacks.. He's Baaack! Reverend Jeremiah Wright Blasts President Obama on Drone Attacks.. In perhaps his harshest criticism of the president yet, the Rev. Jeremiah Wright blasted Barack Obama in a Wednesday speech commemorating Martin Luther King Jr.’s birthday, contrasting the legacies of the two men as "I have a dream" versus "I have a drone." "That's not the man of peace you just talked about," Wright can be heard saying in a portion of video captured via cell phone camera (embedded above). "That's a man controlled by government. A government based on militarism, racism and capitalism."